Did you get your KEYone to sync text messages and photos with your PC with the new Windows 10 fall update. . I managed to connect Your Phone app to the phone after several tries. It says on KEYone that the phone is connected to PC. However I do not see photos nor text messages from my phone on my computer. I can send a text message from PC after manually inputting phone # but I do not see text messages coming to the phone. Neither can I see photos from my phone. It just says syncing and that is it. I can see photos fine but no texts, and I believe this is the source of the issue (link below). MS needs to support RCS if they want to make this a viable service. Hmm not 30 seconds after posting that, I looked up to see that all my messages had synced over. And I didn't change any RCS settings on my KEYone. In fact couldn't find them. So not sure what that's all about. what photo app do you use ? what text messaging app do you use ? 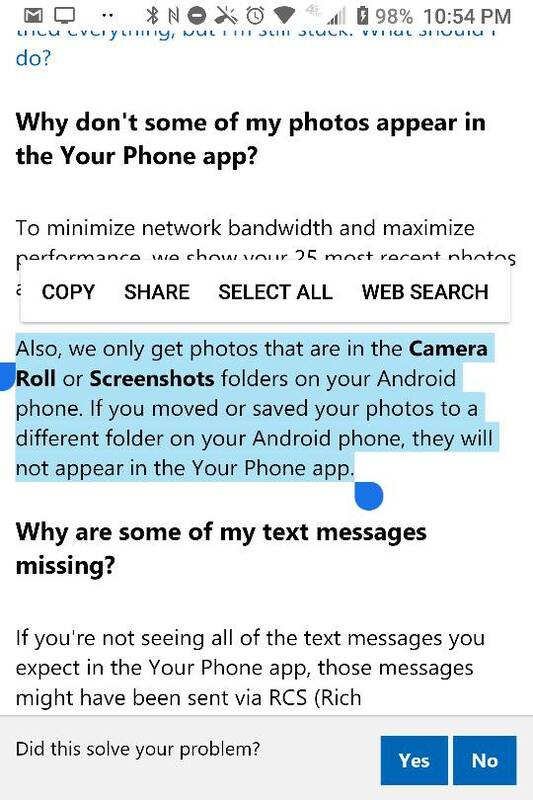 Mine is fine, im in fast ring and Your Phone Windows app only sync "Camera" and "Screenshots" folder. Dont know why. Thank you for the info! Btw, I try to copy a picture from another folder to screenshots folder for your phone app sync. Then I delete the copy picture from screenshots folder but the original picture was gone from the original folder too. So annoying.